It was in 1980 that Seymour Papert published his seminal work ‘Mindstorms: Children, Computers and Powerful Ideas’ in which he largely introduced the concept that computers could be highly effective tools for children’s learning. If there is a moment that indicates the birth of our contemporary use of Information and Communication Technology (ICT) in the classroom this is probably it even more so than the release of hardware like the Apple 2 or the much loved TRS-80. Papert introduced the idea that computers could be used for more than games or for basic productivity purposes. Papert introduced the idea of computers as tools for creativity and making, and developed tools that would allow children to playfully take charge of the computer. When Papert was conducting his initial inquiries into how computers might best fit into education the hardware imposed great limitations upon what could be achieved. This limitation encouraged problem solving but it is hard to argue that we are not much better equipped today to meaningfully integrate computing into our learning environments. It is also hard to imagine any sort of future which will not be increasingly influenced by technology. In 1980 students with access to the latest technology were using the Commodore VIC 20 and would have enjoyed its 20 KB of ROM and up to 32 KB of RAM. At the time programmes were loaded either manually using the keyboard or from cassette tapes. (Can you imagine having to type in the lines of code required for a modern computer game?) Today you can run a VIC 20 emulator built using Java Script inside your computers browser over the internet. Perhaps most telling is when you compare the speed of a VIC 20’s processor which was clocked at just over 1MHz with the chip in a modern-day phone which runs at around 1.4GHz. Thirty-eight years after Papert predicted such a bright future for computers in learning and with such impressive progress in computing power and related technology one would expect that the use of computing has become mainstream and that children are routinely using computers to do great things that could not be otherwise achieved. In many classrooms, this is indeed the case and through an evolutionary process we now see computational thinking and digital technologies along with the ICT general capability in our curriculum. Despite this there continues to be debate about the use of technology within schools. While there is little argument that technology can be used positively, there is a growing push-back fueled by the side effects of our technology use. One area of concern is that the unconstrained use of technology is distracting students from their learning. That our well-intentioned BYOD and laptop programmes are not enhancing learning but are getting in the way of learning. Maybe a part of the issue here is to do with the way our students are using the technology they have and a lack of understanding amongst educators of how the technology we are putting in the hands of their learners might be used to enhance learning. A 2017 article in ’Scientific American’ shared the findings of a set of research projects which are frequently cited as evidence of the negative influence that digital devices are claimed to have on learning. One study reported indicates that students with unconstrained or unstructured access to connected devices spend 40% of their time in activities unrelated to their learning. Such a figure is disturbing on its own and the situation is only made worse when it is shown that students in this group of 84 students spent on average 5 minutes using the internet for class related activities. The point that the researchers make is that the use of devices in this context is impeding learning but one would sensibly ask what opportunities are being missed here? How might the technology that the students have, be better utilised to enhance their learning? If you look at the learning context in which the study takes place you begin to see why in this scenario technology might not be the right tool. Although not described in detail one gets the impression here that the learning involves students as audience members to lecture style presentations supplemented by some online resources such as 'accessing the syllabus, course-related slides or related material or supplemental materials, searching for content related to the lecture’. This is hardly the creative use of computers that Papert imagined and at best is pitched at what Ruben Puentedura would label as ‘substitution’ use of technology; that is technology as a substitute for what could be equally achieved with a non-technological solution. While the article acknowledges many positive uses for laptops as tools for learning, their use as note taking tools is questioned. Note taking is the only non-consumption use described in the article. Research is cited that reports on a study by researchers at Princeton and UCLA into the depth of learning achieved by students who take notes using a laptop compared to notes taken by traditional pen and paper methods. It is worth exploring this further. What if the notes that the students took during the class were shared online afterwards and were used as a catalyst for online discussion and dissection? What if the students and the teacher used this forum to unpack and expand their understandings? What if the lecture had an official back-channel that focused not on recording notes, but on sharing questions and wonderings posed by the lecture? How might such a resource later be used by students as they make sense of what they have listened to but are yet to master? In our highly connected worlds it becomes quite possible that a note taking system backed by a social network dimension could involve experts in the field and that their contributions could significantly enhance the learning. Tools such as ‘Padlet’ make this form of collaborative note taking easy. In place of taking individual notes, students share their thinking as they listen and the posts of one student become the catalyst for responses and discussion. Padlet is a digital Pin Board that allows users to share ideas, post replies, link ideas and infinitely rearrange notes. For users of ‘Google Slides’ the built-in Q&A feature allows another way for learners to engage with the content. Not only do the students gain from the many perspectives shared in this way, the teacher gets to see in near real time how their presentation is being interpreted or misinterpreted. ‘Answer Garden’ allows interactions around specific questions with a visualisation of the most common answer provided. Answer Garden could be used by the teacher as a quick check in on the developing understanding of the class and with the right question would be a tool for focusing the students on the most essential concepts. These tools change the dynamic of the learning environment and unless the affordances that they bring are utilised effectively by the teacher they are likely to become a layer of distraction. Where such tools are incorporated into the learning environment , are used to actively inform the presentation of content, engage students with that content, allow for interaction and support reflection, learning should increase and the teacher should be able to more immediately address gaps in understanding. What if the notes that the students took were non-linear? Mind mapping tools such as Inspiration allow for the connections between ideas in a note to be made clear but with the use of hyperlinks allow for connections beyond the document. What if students constructed a mind map from their notes after the class and then shared that with their colleagues and teacher for feedback. Tools such as ‘OneNote' and ‘Evernote' make it easy to add rich media to notes and to link from one note to another. Having more information alone is not enough but such tools, when used to explore connections between ideas should foster the deeper understanding that simple typed notes fail to achieve. What if the notes were not only typed but included handwritten notes, diagrams and sketches created using a stylus and touch enabled device? Sketchnoting is the new darling of the note taking world and the beautifully constructed notes of sketchnoters such as Sylvia Duckworth show how this artful capturing of learning allows for a deep and conceptual understanding. Books such as ‘The Doodle Revolution’ by Sunni Brown and ‘The Sketchnote Handbook’ by Mike Rhode make this an accessible skill. Not that sketchnoting requires technology, but for those who are somewhat artistically challenged, the ease of editing and the ability to use pre-drawn images that comes with its use can do much to enhance the results. What if students used a tool like ‘Liquid Text’ to analyse their notes after the class. Liquid Text allows users to grab parts of a document and re-combine them in new ways while preserving their original place within the document. Students equipped with their detailed typed notes could identify the connections between ideas and use Liquid Text to drag snippets into groups around key concepts. How might computational thinking bring a new perspective on the notes we take and the information we access as we learn. A tool as simple as WordArt will perform a basic analysis of text identifying words commonly used and making this visible. A tool such as this can reveal patterns and shine a light on what might not otherwise be seen. 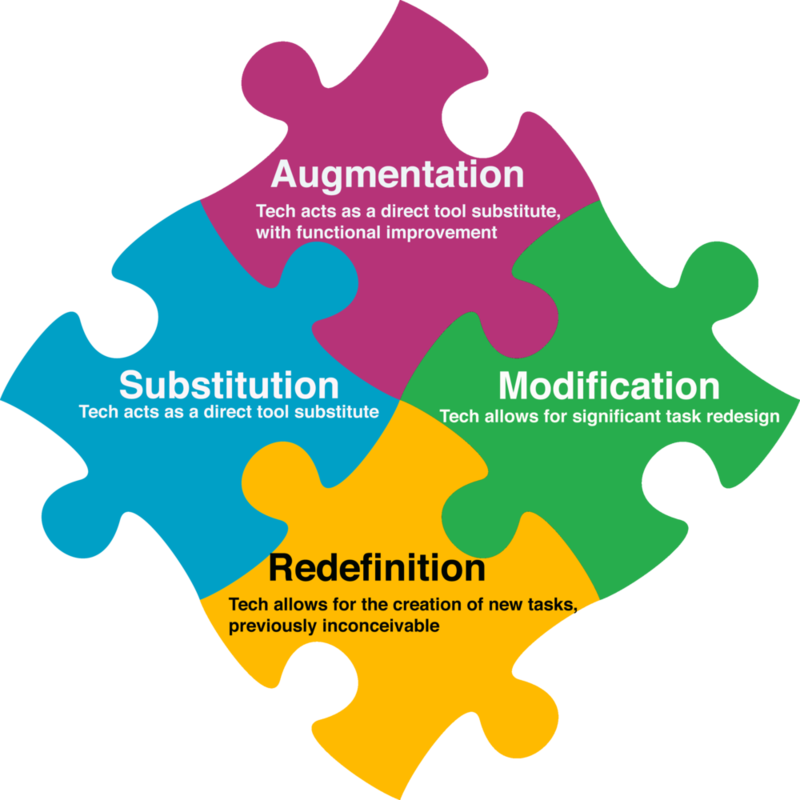 The point is that if our use of technology remains at the level of substitution we should not be surprised when it does not enhance learning. Add the very real possibility for distraction that technology brings and it should be clear that using technology as a substitute for traditional methods is not going to achieve comparable results. The challenge is to find ways by which technology can enhance learning. We can be certain that technology is not going to go away and that those who maximise the affordances that it brings are likely to gain the most from it.